I am a firm believer in the idea that life is short and you should eat dessert first. Of course, you should totally eat a big pile of organic broccoli and some sustainably caught seafood right afterwards but dessert is a vital part of my diet! I have a serious sweet tooth and one thing I absolutely love is chocolate. This brownie recipe uses three different chocolates for an amazingly rich dessert recipe your family will love. I chose to use a combination of milk chocolate for the brownie itself, a white chocolate ganache filling and then a dark chocolate glaze. You could switch the layers up if you want, depending on what you are trying to create. When buying chocolate you absolutely get what you pay for. Cheap chocolate is not worth your money at all. I usually look for a combination of organic or at least sustainably raised chocolate. The flavor is so much richer and you can rest assured that the cocoa beans were grown with as little impact to the surrounding environment as possible. The same goes for the extracts you use for flavorings…go with organic if at all possible and never, EVER use the artificial stuff! Blech! The key to getting this brownie recipe to look pretty is to make sure everything is totally cool before you cut it. Refrigerating overnight is very helpful. I know, I KNOW…how are you suppose to not eat these delicious goodies when the house smells like homemade brownies, right? Well, if you don’t care what they look for just dive right in whenever you want! 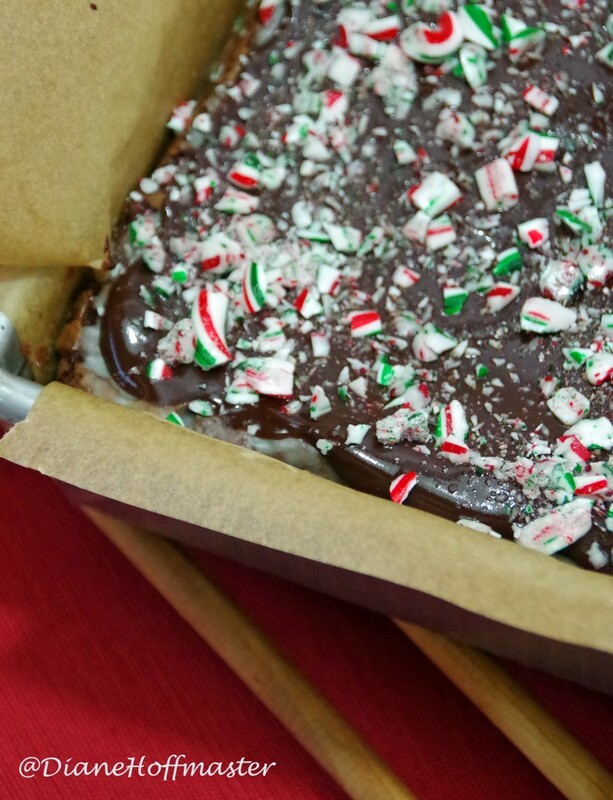 Topped with crushed candy canes this brownie recipe will make a delicious Christmas dessert recipe the next time you have company over. If you can bring yourself to share! 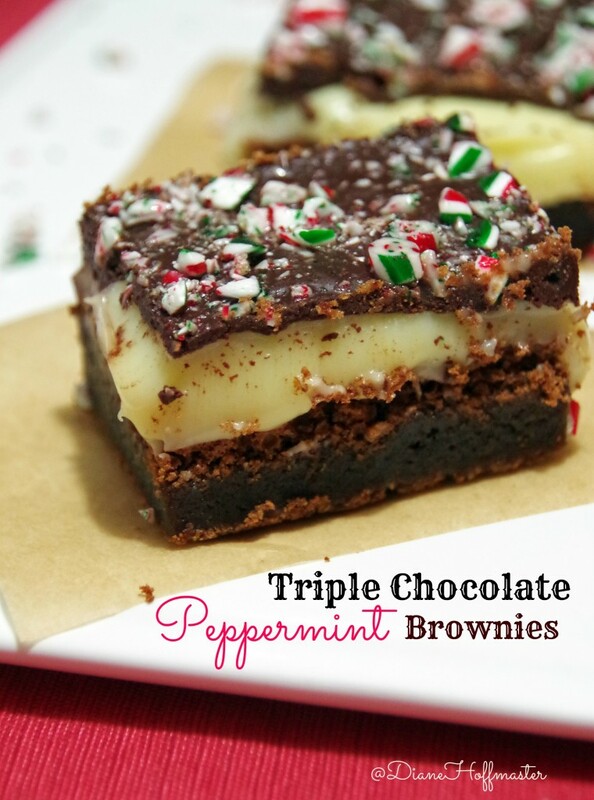 A rich, chocolate brownie recipe with a minty touch! Prepare pan: line an 8 inch by 8 inch square pan with parchment paper and spray with non stick spray or brush with oil. In a small sauce pan over medium heat melt the butter and the milk chocolate. In the bowl of a mixer, add eggs and brown sugar. Add the vanilla and peppermint extracts to the egg/sugar mixture and mix again. While paddle of mixer is going (or while stirring) slowly pour in the chocolate/butter mixture. It should be warm but not hot. Pour into pan and bake at 325 degrees for 45 minutes. Remove and let cool completely at room temperature. Heat the heavy cream in a medium pan over low heat. Add the white chocolate and stir until melted. Let cool slightly and pour over the cooled brownies. Let cool. In a small pan, combine the mint chocolate, butter and corn syrup. Heat over medium heat until melted. Let cool 5 to 10 minutes before pouring over the white chocolate ganache. While glaze is still warm, sprinkle with crushed candy canes. Refrigerate several hours and cut with sharp knife. For a cleaner cut you can run the blade under hot water before cutting and clean in between cuts. Recipe adapted from Butter cream Blondie.